ASTM B564 XM-12 Stud Bolt, ASTM F2281 UNS S15500 Stud Bolts, 15-5 PH SS Stud Bolts Dealer, 15-5 PH Stainless Steel Industrial Stud Bolts Stockists, UNS S15500 Full Thread Studs Bolts, Suppliers, UNS S15500 Half Threaded Studs Bolts, Distributors of XM-12 Double End Stud Bolts, DIN 1.4545 Single End Stud Bolts, 15-5 PH Fasteners in Mumbai, India. 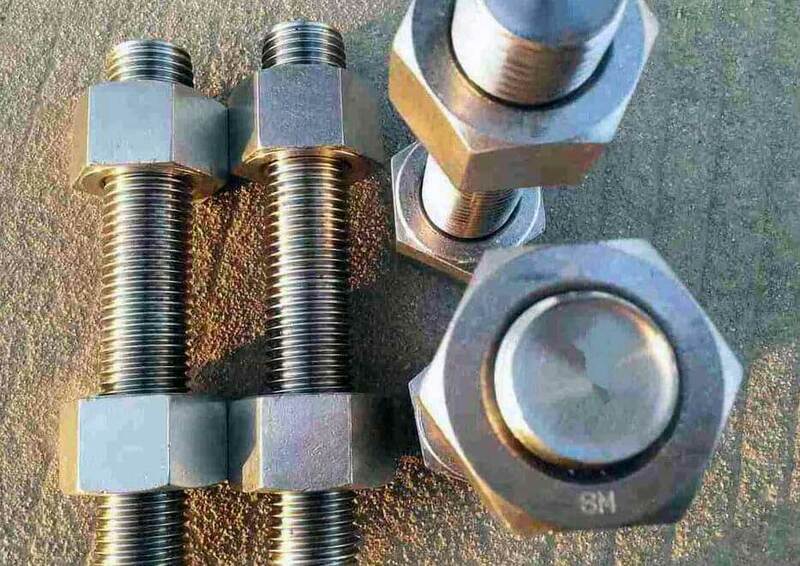 UNS S15500 ANSI B18.2.1 Custom Stud Bolt, ASME SB564 15-5 PH Stainless Steel Heavy Stud Bolts Wholesaler, DIN 1.4545 Stud Bolt, Alloy XM-12 Continuous Threaded Stud Bolts, UNS S15500 Machine Stud Bolts Manufacturer, DIN 976 15-5 PH Weld Studs Exporters. Renine Metalloys is a known manufacturer of Stainless Steel UNS S15500 Stud Bolts, which should not be forged below 1850 Deg F (1010 Deg C). 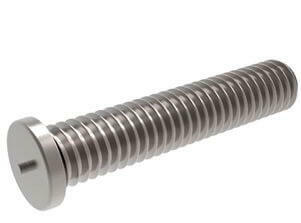 The general level of corrosion resistance in Stainless Steel 15-5 PH Stud Bolts exceeds that of Types 410 and 431, which has precipitation hardening until the desired condition is reached. 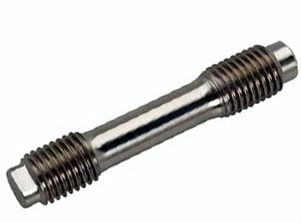 Alloy 15-5 PH Stud Bolts is supplied in Condition A, ready for fabrication and subsequent hardening by the user, which further can be machined under any of the attainable conditions. 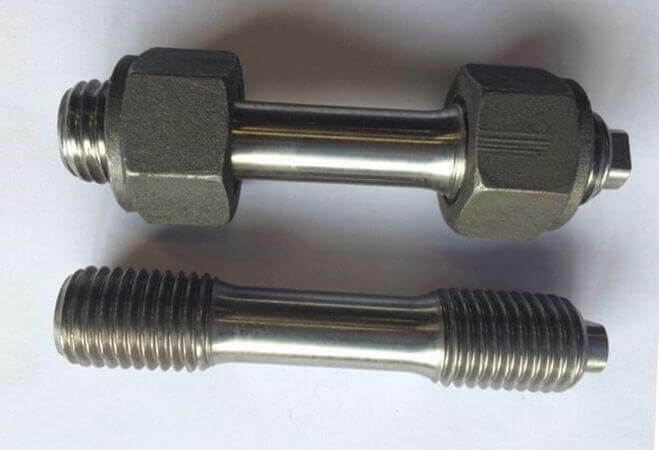 15-5 PH Stainless Steel Stud Bolts should be uniformly heated to 2150 Deg F / 2200 Deg F (1180 Deg C / 1205 Deg C) and held for 1 hour before forging. 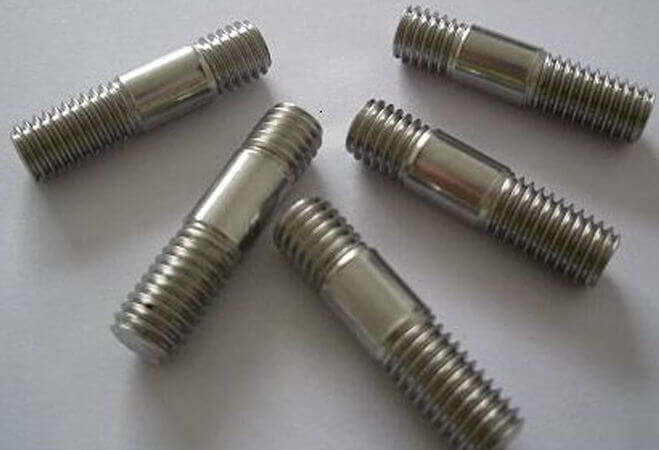 After machining or another fabrication method for Stainless Steel XM-12 Stud Bolts, a single, low temperature heat treatment can be applied to increase the strength of the steel. 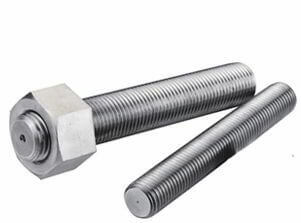 Alloy XM-12 Stud Bolts is capable of being formed only in a mild manner, where best results can be obtained when this alloy is formed in the over-aged condition. 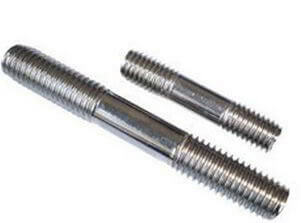 XM-12 Stainless Steel Stud Bolts is used for Aerospace, Petrochemical, Food Processing, Chemical, Pulp and Paper, etc. 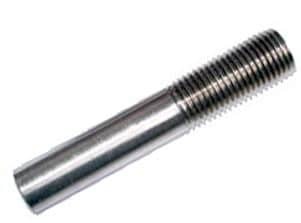 Stainless Steel DIN 1.4545 Stud Bolts is also used for high pressure corrosive fabricated parts such as valves, shafts, fasteners, fittings and gears. SS 15-5 PH Stud Bolts can be further heat-treated when in precipitation-hardened condition to provide improved resistance to stress corrosion cracking for high temperature applications. 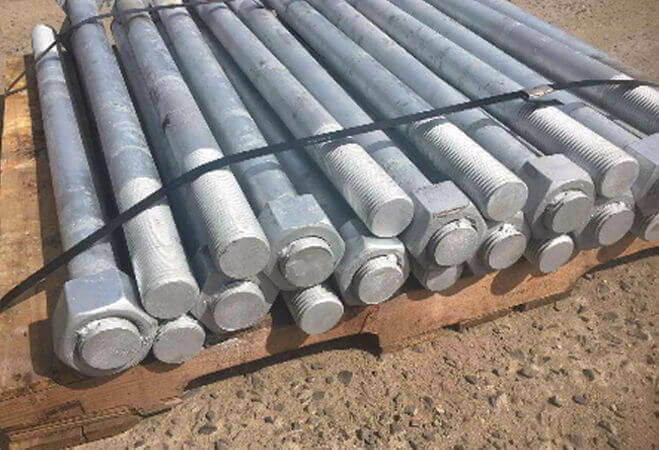 15-5 PH Reduced Shank Stud Bolt, DIN 1.4545 Stud Flange Bolts, UNS S15500 Metric thread Stud bolts Exporters, XM-12 Partial Threads Stud bolts, 15-5 PH Stainless Steel All Thread Stud Bolts Suppliers, UNS S15500 High Tensile Stud Bolts Traders. 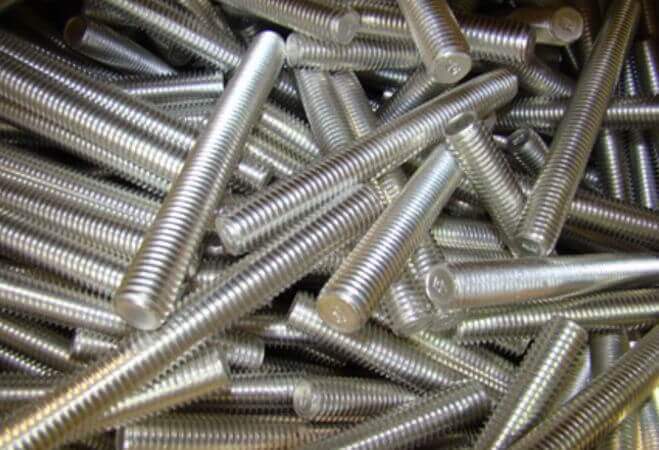 15-5 PH Fasteners, 15-5 PH Stud Bolt, XM-12 Stud Bolt, UNS S15500 Stud Bolts Exporters, DIN 1.4545 Stud Bolt, 15-5 PH Customized Stud Bolt, ASME SF2281 15-5 PH Heavy Stud Bolts, ASTM F2281 UNS S15500 Cold Forged Stud Bolt, ASME SB564 XM-12 Hot Forged Stud Bolts, 15-5 PH Stainless Steel Metric Stud Bolts, 15-5 PH SS Tap End Stud Bolts, DIN 1.4545 Industrial Stud Bolts, UNS S15500 Fully Threaded Studs Bolts, DIN 1.4545 Half Thread Studs Bolts, ASTM F2281 15-5 PH High Strength Stud Bolts, ASTM B564 15-5 PH Continuous Threaded Stud Bolt, 15-5 PH Double End Stud Bolts, Werkstoff No 1.4545 Flange Stud Bolts, XM-12 Welding Studs Bolts, UNS S15500 Double End Stud Bolts with Reduced Shank, XM-12 High Tensile Stud Bolt, UNS S15500 Reduced Shank Stud Bolt Exporter, 15-5 PH Single End Stud, UNS S15500 Stainless Steel All Thread Stud Bolts Supplier, UNS S15500 Metric thread stud bolts, ASTM F2281 15-5 PH Weld Studs, ASTM B564 15-5 PH SS Threaded Rod, XM-12 headed weld stud bolts, Alloy XM-12 Stud Bolts Stockist, UNS S15500 Partial Threads Stud Bolt, UNS S15500 Large Diameter Stud Bolt, 15-5 PH SS Heavy Stud Bolt, UNS S15500 Headed Stud Bolts, UNS S15500 Step Bolts, UNS S15500 Custom Stud Bolts Stockists, Supplier of High Quality 15-5 PH Stud Bolts, Manufacturer of XM-12 Stud Bolts Traders, Exporters of UNS S15500 Stud Bolts, DIN Standard 15-5 PH Stud Bolt ANSI Standard 15-5 PH Stud Bolt, BS Standard 15-5 PH Stud Bolt, ISI Standard 15-5 PH Stud Bolt, ISO Standard 15-5 PH Stud Bolt. Jaipur, Coimbatore, Surat, Mumbai, Madrid, Busan, Sydney, Indore, Ulsan, Visakhapatnam, Ernakulam, Toronto, Montreal, Chandigarh, Jakarta, Ahmedabad, Pune, Bogota, Port-of-Spain, Petaling Jaya, New Delhi, Istanbul, Bengaluru, Colombo, Dammam, Riyadh, La Victoria, Singapore, Courbevoie, Rajkot, Hong Kong, Ludhiana, Baroda, Chennai, Ahvaz, Turkey, Pimpri-Chinchwad, Noida, Bhopal, Manama, Dubai, Abu Dhabi, Al Khobar, Hanoi, Haryana, Jamshedpur, Algiers, Milan, Howrah, Geoje-si, Ranchi, Kolkata, Gurgaon, Australia, Lagos, Kanpur, Vadodara, Thane, Thiruvananthapuram, Navi Mumbai, Secunderabad, Faridabad, Chiyoda, Tehran, Mexico City, Ho Chi Minh City, Caracas, Granada, Bangkok, Aberdeen, Cairo, Rio de Janeiro, Gimhae-si, Seoul, Calgary, Jeddah, Moscow, Hyderabad, Atyrau, Nagpur, New York, Muscat, Los Angeles, London, Edmonton, Karachi, Brisbane, Perth, Lahore, Sharjah, Santiago, Kuwait City, Nashik, Dallas, Al Jubail, Vung Tau, Doha, Kuala Lumpur, Houston. Qatar, Mexico, Indonesia, Norway, Sweden, Thailand, Australia, Tibet, brazil, Peru, Romania, Belgium, Lebanon, United States, Slovakia, Canada, Gambia, Turkey, Switzerland, Libya, Trinidad & Tobago,Tunisia, Chile, United Kingdom, Ecuador, Germany, China, Ireland, Bhutan, Finland, Morocco, Afghanistan, India, Bolivia, Croatia, Kuwait, cyprus, Gabon, Israel, Jordan, South Africa, France, Nigeria, Egypt, New Zealand, Colombia, Hong Kong, United Arab Emirates, Philippines, Saudi Arabia, Denmark, Taiwan, Netherlands, Yemen, Bangladesh, Iran, Serbia, Nepal, Estonia, Venezuela, Singapore, Italy, Puerto Rico, Lithuania, Iran, Greece, Ghana, Russia, Ukraine, Belarus, Zimbabwe, Bahrain, South Korea, Argentina, Czech Republic, Vietnam, Azerbaijan, Bulgaria, Algeria, Brazil, mexico, srilanka, thailand, malaysia, Malaysia, Namibia, Chile, Austria, Kazakhstan, Hungary, Japan, Macau, Costa Rica, Spain, Portugal, Mongolia, Sri Lanka, Nigeria, Poland, Poland, Oman, Mexico, Kenya.